Unfortunately, Amflee Combo Spot-On Solution for Dogs is not available for sale anymore. Please have a look at our entire Flea Treatment for Dogs range for alternatives. This spot-on product for dogs is an effective and easy-to-use product to combat fleas, ticks, biting lice, flea larvae and flea eggs. It prevents the flea population from reproducing in your house by stopping the development of eggs and larvae. It is easy to administer with a pipette. Dosage: Use 1 pipette per treatment. There are various pipettes available for the various weight classes. You choose the pipette that is suitable for your dog's weight. Administration: Take the pipette out of the packaging and twist and pull off the lid. Place the other side of the lid back onto the pipette. Now press and twist to break the seal. Now you can squeeze the pipette onto the skin in one place, at the base of the neck between the shoulder blades. The advice is to refrain from washing your dog or letting your dog swim for 2 days and do not bath your dog more than once a week. Do not use Amflee Combo in puppies younger than 8 weeks and/or with a weight of less than 2kg. Do not use if your pet is sick, recovering or hypersensitive to one of the active substances. Do not repeat the treatment within 4 weeks. Amflee Combo can be used during pregnancy and lactation. 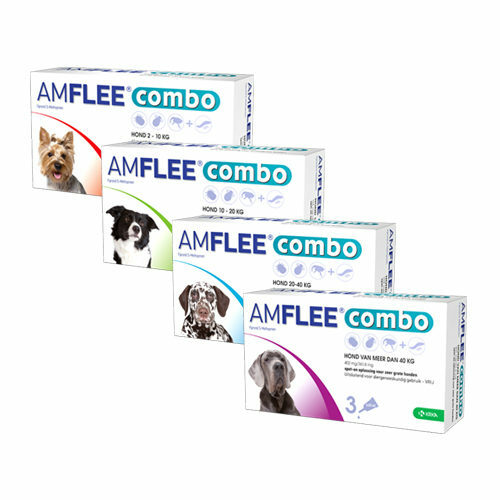 Have you used Amflee Combo Spot-on Dog before? Let us know what you think about this product.